Arthur McKerron is hosting a screening of home movies about the town during the 1960s and 1970s. They were all filmed by his late grandfather, also called Arthur, who enjoyed walking about with his camera taking videos. Now the 16mm films will be show at Elgin Town Hall to raise money for charities including The Grant Lodge Trust and The Oaks. Some of the historic occasions captured include parades at Cooper Park, the Royal Yacht Britannia visiting Lossiemouth and the last steam train heading from Elgin. The two films last about one hour 45 minutes and are just a tiny part of an extensive collection of home movies Mr McKerron was given from his grandfather. He said: “There are miles of footage that has been passed down and I just wish I had the time to watch all of them. “Some of them are quite remarkable, with my grandad taking them in France, Australia and Spain where he used to walk about in just his kilt and bagpipes. 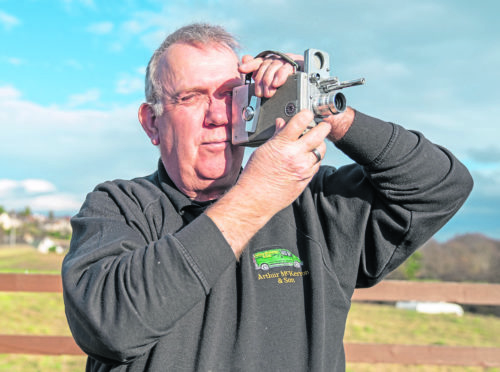 The collection of videos even garnered interest from Grampian TV who wanted to convert some of the footage for television, but Mr McKerron said his grandfather wanted to keep them in the family and use any money they raised for charity. He said: “I used to do showings regularly, the last big one was 15 years ago and now I want to try and raise money for some local charities like the Grant Lodge Trust and The Oaks. The fundraiser will be held on March 29 at 7.30pm in the town hall. Tickets are £5 and are available from Sound and Vision or the town hall website.